Snow Removal Equipment adapts to everyday vehicles. Snowbox, V-plow, Wing Plow, and Angle Plow can be easily interchanged. Three-point hitches allow for hook up to almost any vehicle or tractor. Depending on requirement, end user can use attachments independently or in combination with each other. No major modifications are needed to attach CCA Wing or Snowbox. As snow gets deeper, design allows operator to change plow from pickup to backhoe in 5 minutes. 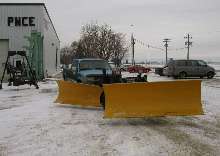 Paul Wever Construction Equipment Company (PWCE) has developed Snow Removal Equipment that is both economical and adaptable to everyday vehicles - especially the ever popular pickup truck. PWCE has developed a Snowbox, V-plow, Wing Plow, and Angle Plow that can be easily interchanged. These attachments are made with 3-point hitches allowing foreasy hook up to almost any vehicle or tractor. Depending on the need, the end user can use these units independently or in combination with each other. This new and innovative design allows for tractors and trucks to be equipped with a Wing Plow in less than 2 minutes. No major modifications are required to attach the CCA Wing or Snowbox. As the snow gets deeper, this design allows the operator the liberty to change the plow from a pickup to a backhoe in just 5 minutes. The PWCE Snow Removal Equipment finally gives the average truck owner the samecapabilities to plow snow as the large equipment owners. Individuals and municipalities that don't have the funds to purchase large snow removal equipment can now economically keep up with their snow removal needs.